Rely on Chapman Smith for your vinyl fence reinforcement hardware needs. Superior quality components. Aggressive direct-to-you pricing. Quick delivery too. Most items ship immediately from stock. Steel and aluminum rail reinforcements. Surface and deck mounts. Steel and aluminum post stiffeners. 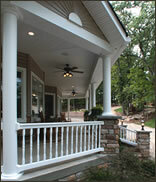 Aluminum porch column supports. For fence reinforcements, if you are looking for the right quality, price and delivery equation - you found it. Home Store My Cart My Account Privacy Terms © Copyright 2010. All Rights Reserved.